You are now refining those parts of you that are stellar and magnificent and luminous. You are refining and gathering all pieces of your Soul to greet and acquaint yourselves once again with the very essence of you, split and pulled away only for purposes of learning and experiment. You gather them back now, dear ones, and you prepare for an even more pertinent part of your journey. For you know now much more about who you are, and so it takes your intention and your realization that you are moving forward with your divine purpose. You are discovering it now, dear ones, and from now on it will take even more discernment and clarity to stay in the higher dimensions. For this refinement is ever developing within you. For you are lighter and higher beings than you were yesterday, solely for the reason that you clear and make way for your True Selves to emerge even stronger and with more meaningful direction. With the filaments of light ever present now, you are weaving and illuminating parts of yourself that once were dormant, for you would not have been able to restore yourself to full glory until now for many reasons. The timing was not right. It is becoming right and ripe now, dear ones. Gather up all parts of yourself by daily immersing yourself in your psyche and in your heart, Living in your Heart, and exploring the many facets of you that want to shake loose to allow the higher frequencies to flourish. I, like you, have many facets that have been refined in my ascension, just as you are continuing to do right now. Your soul is “becoming” what it is in its potential, dear ones. And you move forward with much more understanding of yourselves as you look very deeply at what is really part of your Soul Light and what is part of the many pieces of your personality that no longer serve you, and as you look at the many experiences that you dabbled in for the sole purpose of growth. It is time to acknowledge them and tuck them away into the Light generated by your Soul to be transformed, for you to be renewed and reborn into your Wholeness. It is time now to dabble no more, but only to play with the refined pieces of your Soul that awaken you to greater heights in consciousness. Step up, dear ones. See everything now from a higher state of being, a more refined state of being. You are ready for this. In all your trials, you never faltered long. You always gathered the lessons and moved on. Now you will see many opportunities to test your ability to move on quickly through obstacles that may be in your path, to decide quickly with choices that are presented to you, and to squirrel away the doubt to be replaced with a sense of certainty and knowing that you are heading in the right direction for you, if you just allow yourself to sit quietly with the choices and ask your Higher Self to examine them with you before making a decision. The choices are coming fast and furious now, it seems, because you are looking at many timelines. You have the opportunity to choose the best one for you based on your deeply felt sense of purpose and mission and we see many of you putting your hearts and souls into the circumstances presented before you, examining them with refined discernment and knowing, and choosing the right one for you. And yes, each attention paid to what is your deeply held desire and purpose will be rewarded with a flow and swiftness of completion speeding you along to more opportunities to realize your true selves, purpose and mission. 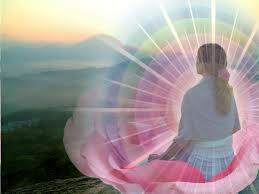 Make it your priority to sit with, welcome and Be with your Souls and your Hearts, for this is where you reside now. The remnants of yesterday’s structures and realities that used to be your priority will dissolve much more quickly as you pay attention to your Soul Light and sit with it daily, allowing it to engulf everything that is around you. Let it Become you now. You are learning that what you are is magnificent and you are well on your way to being permanently aglow with your natural Divine Essence. And the changes around you that you will see will be astounding as you lift yourself higher to your rightful place in complete Illumination and Splendor as you complete your transformation back to your True Essence in all its Glory, with Source. This entry was posted in channelings and tagged 9 June 2013, Ascension, Asended Masters, Becoming Aglow With Your Natural Divine Essence, Fran Zepeda, Heart, Higher Dimensions, Living in Your Heart, love, Mary Magdalene, soul, Soul Light, Source, Spiritual Awakening and Transformation, True Essence, True Selves, Wholeness. Bookmark the permalink.